In Perez v. Mortgage Bankers Association, 135 S.Ct. 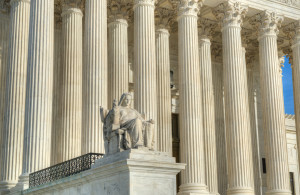 1199 (2015), the U.S. Supreme Court held that federal agencies do not have to follow the “notice-and-comment” procedures of the Administrative Procedures Act (APA) when they substantially alter the interpretations of their own regulations. In so ruling, the unanimous Court largely dismissed concerns that condoning the practice would allow federal agencies to arbitrarily make legislative policy under the pretext of interpretive rules. The case concerned the Department of Labor’s position regarding whether mortgage-loan officers qualify for the administrative exemption to overtime pay requirements under the Fair Labor Standards Act (FLSA). In 2006, the DOL’s Wage and Hour Division issued an opinion letter finding that mortgage-loan officers fell within the administrative exemption. In 2010, the agency altered its interpretation of the administrative exemption. Without notice or an opportunity for comment, the Department withdrew the 2006 opinion letter and issued an Administrator’s Interpretation concluding that mortgage-loan officers do not qualify for the administrative exemption. The Mortgage Bankers Association (MBA) filed suit. It alleged that the 2010 interpretation was procedurally invalid under the D. C. Circuit’s decision in Paralyzed Veterans of Am. v. D. C. Arena L.P., 117 F. 3d 579, in which the court held that an agency must use the APA’s notice-and-comment procedures when it wishes to issue a new interpretation of a regulation that deviates significantly from a previously adopted interpretation. The U.S. Supreme Court reversed. It held that the Paralyzed Veterans doctrine is contrary to the clear text of the APA’s rulemaking provisions and improperly imposes on agencies an obligation beyond the APA’s maximum procedural requirements. In a separate concurring opinion, Justices Antonin Scalia, Clarence Thomas and Samuel Alito Jr. noted that the D.C. Circuit’s decision was likely influenced by an “understandable concern about the aggrandizement of the power of administrative agencies.” They also raised concerns about the ramifications of the Court’s decision in light of the Court’s prior ruling in Bowles v. Seminole Rock & Sand Co., under which courts must defer to an agency’s interpretation of its own ambiguous regulations. “Agencies may now use these rules not just to advise the public, but also to bind them,” Justice Scalia acknowledged. “Interpretive rules that command deference do have the force of law.